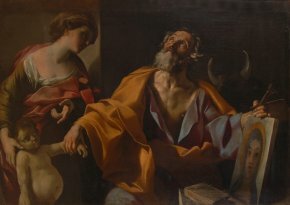 6/02/12 – Acquisition – Rome, Palazzo Barberini – A painting by Giovanni Lanfranco recently joined the collections of the Museum at the Palazzo Barberini in Rome ; sold by the Italian gallery, Alberto Di Castro, it represents Saint Luke Healing the Dropsical Child (ill. 1). The iconography seems to blend an episode from the life of Christ to that of Saint Luke’s. The saint is seen with his attributes : the bull, the Gospel and the portrait of the Virgin he himself painted. Besides his skills at writing and painting, legend tells us that Luke also practiced medicine and appears to be examining a child stricken with dropsy ; the scene might be an allusion to one of Christ’s miracles when he healed a dropsical man (narrated in fact in Luke’s Gospel, 14, 1-6). The contrast of light and shadow underscores the dramatic tension of the composition with its tight centring as well as emphasizing the eloquence of the gestures and looks of the figures. 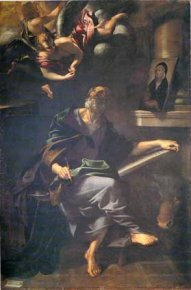 There exists another known work by Lanfranco depicting the Evangelist in an ecstatic attitude which is rather similar to this one, produced in 1611 for the décor of Saint Luke’s chapel at Santa Maria delle Grazie in Piacenza (ill. 2). 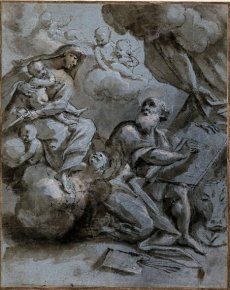 Also, a drawing held at the British Museum (ill. 3) shows the saint painting the Virgin, who is shown in profile much like the woman in the canvas now belonging to the Palazzo Barberini.